The DRYPRO 873 delivers unparalleled image quality and fast technology to meet the demanding needs of your digital imaging department. The versatile, compact, fast and eco-friendly DRYPRO 873 offers a new dimension in image quality and advanced technology. This compact Dry Laser Imager boasts the world’s smallest design yet has a high throughput of 90 films per hour with four film sizes (choice of: 14"x17", 11"x14", 10"x12", 8"x10"). The DRYPRO 873 is mammography ready with 43.75µm and 4.0 Dmax. With the DRYPRO 873, the developing process has been redesigned for fast mass volume processing. The use of a feed roller in the film supply unit and adoption of the plate-method heating unit contribute to creating the shortest film pass structure. Experience 14-bit grayscale output, 50 seconds first print time, up to three film trays, and a maximum of 16 DICOM connections. The simple design emits less noise for a user-friendly working environment. The system configuration saves the image data to an external PC, eliminating the hard disk drive from the unit for a more stable system operation. The DRYPRO 873 is engineered for ease-of-use, featuring system status indicators, such as Film Empty and Tray Selection that are easily recognized from a distance. The standard film supply uses two trays but up to three trays can be optionally mounted. An additional optional film supply tray for the DRYPRO 873 (four sizes from 14"×17" to 8"×10") is available. Any combination is possible depending on your requirements. The optional 6-channel sorter is also available, which is useful for sorting by modality after printing. By adopting a number of new technologies, the first print output has been reduced significantly to about 50 seconds. 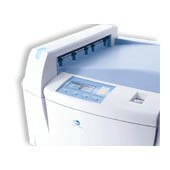 The DRYPRO 873 can enhance workflow up to 180 sheets (mixed sizes) per hour. The combination of the optical unit (43.75μm) that enables detailed recording and the SD-QM film can support a maximum density of 4.0 Dmax in two film sizes, 8"x10" and 10"x12". For daily maintenance of mammography, this imager can support mammography QC patterns for film density control and quality digital mammography imaging*. *Cleaning is recommended every 2000 sheets.